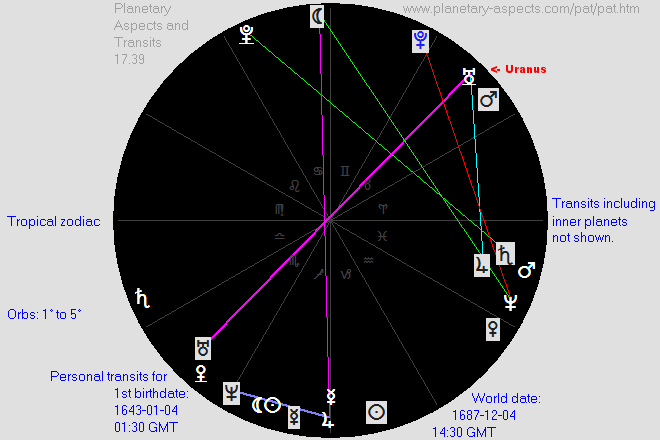 As Uranus moves through the heavens it forms successive aspects with the position of Uranus in the natal chart. 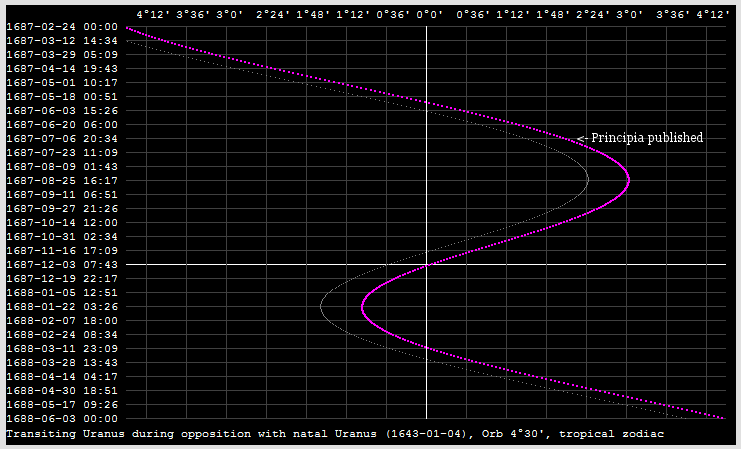 Uranus takes about 84 years to return to conjunction with the natal Uranus. 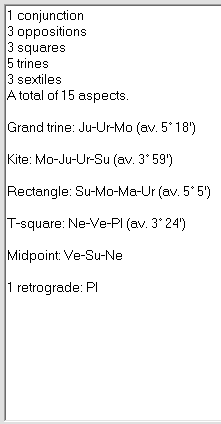 So after about 21 and 42 years respectively it forms first a square and then an opposition with the natal Uranus. In his book Cosmos and Psyche Richard Tarnas presents evidence that these are (synchronistically) associated with significant events or processes in a person's life. 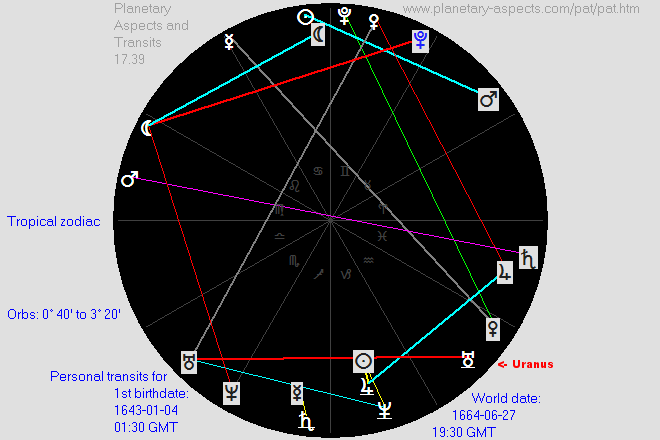 [In] the case of Newton, the square and opposition points of the Uranus cycle precisely coincided with the two famous periods of his life that brought forth his most important scientific achievements. 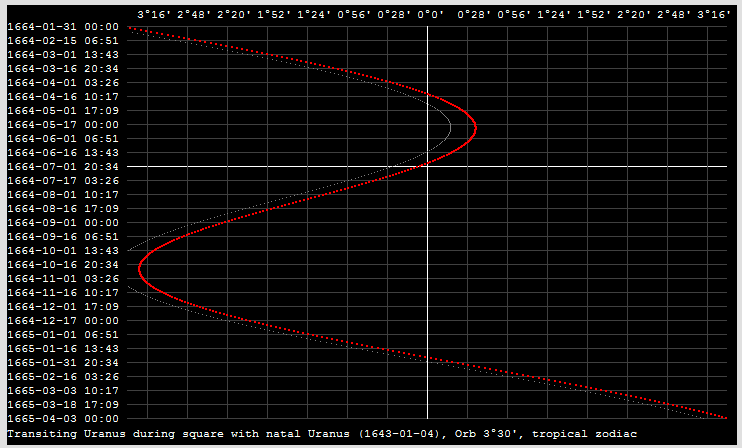 From January 1664 to December 1666, Uranus was at the 90° point of its cycle, within 5° of exact alignment. It was precisely during the years 1664 to 1666, when he was in his early twenties, that Newton laid the foundations for his later work: developing the binomial theorem and the calculus, performing advanced research in optics, and deriving the inverse square relation for planetary motion. 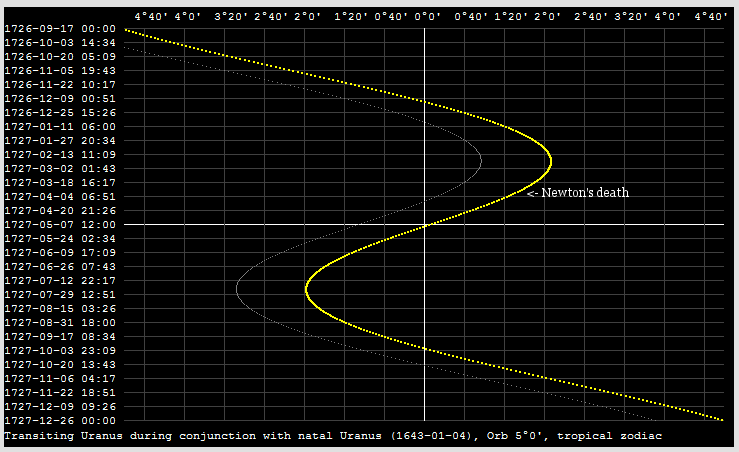 Thus a perfect symmetrical pattern was visible in the larger trajectory of Newton's life: These early discoveries, which were the necessary forerunners of the Principia, occurred when Uranus had moved 90° from its position at Newton's birth, while the Principia itself, containing his formulation of the three laws of motion and the law of universal gravitation, was published when Uranus had moved exactly 90° further, to form the 180° opposition. 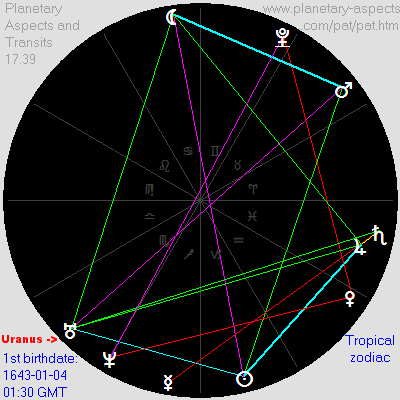 So we might expect that the period from September 1706 to July 1709, and especially the period from June 1707 to September 1708 (during which Uranus again became exactly square to the natal Uranus three times) would also be associated (synchronistically) with significant events or processes in Newton's life of a Promethean character. Unfortunately we find little in this respect, although what was significant for Newton (as, perhaps, an inner psychological process) might not strike us as significant even if we knew of it. Newton was elected president of the Royal Society in 1703 and was re-elected each year until his death. In this position he exercised a tyrannical role and engaged in fierce quarrels with his critics, in particular with the German mathematician and philosopher Leibniz regarding the invention of the calculus, although the controversy regarding the calculus did not become heated until after 1709. Newton died on March 31, 1727 (Gregorian Calendar).